Comforting, cheesy meals are the center of my cold weather months in New England. That’s why this Creamy Butternut Squash & Bacon Pasta has become one of my favorite this season – luscious with a smooth butternut squash and cream sauce, this will become a family favorite from the first time you make it! This post is sponsored by Hood® . Pasta is that one ingredient that is always in my pantry – and something that’s always in my fridge is heavy cream. Thankfully, this holiday season I am working with Hood® and that’s the brand that we purchase whether or not they’re my client. It’s a brand that we also use in the restaurant and one I fully trust, so between pasta in my pantry and heavy cream in my fridge, I’m halfway to a meal! For more than 170 years, the name Hood® has been synonymous with fresh, quality dairy products that taste great – and if you’re in New England, it’s probably the brand in YOUR fridge as well. This Creamy Butternut Squash & Bacon Pasta is a quick and simple dish that is fast enough to make for your family on any night of the week yet impressive enough to serve up to guests during a weekend dinner party. The real treat in this pasta recipe is the velvety smooth, creamy and cheese butternut squash sauce! It’s made by boiling butternut squash until tender and the blending with a mixture of heavy cream, cheese, and butter – it makes a sauce that is a bit healthier than the regular cheese sauces but just as decadent. 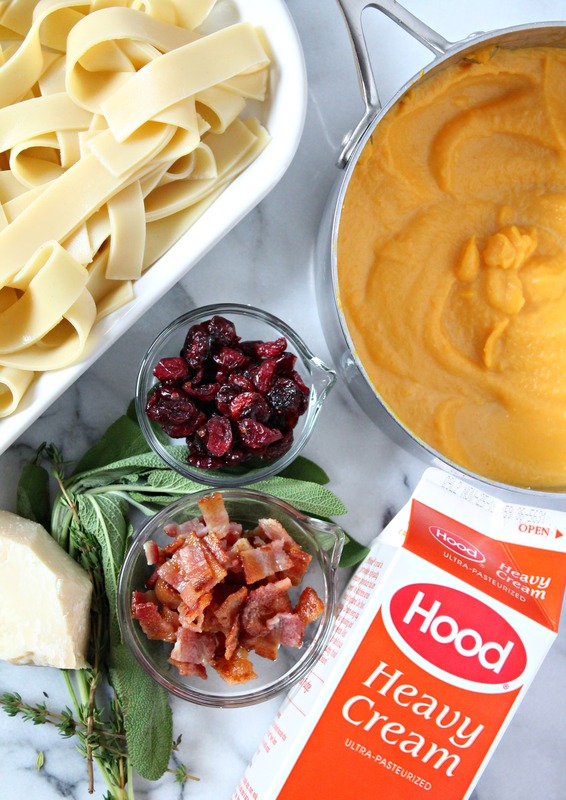 Hood® Heavy Cream makes the squash smooth when blended – a must in a pasta dish! You could also use half and half here, it just won’t be as luscious but still quite tasty. 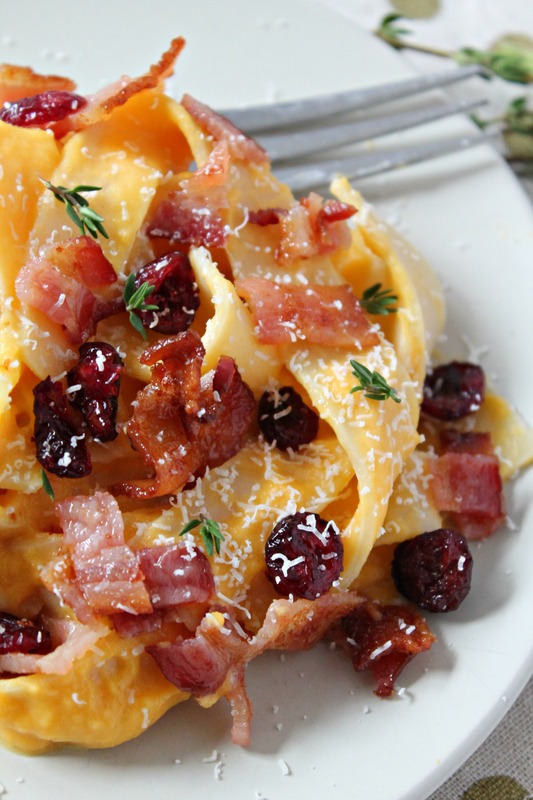 And to take this butternut squash pasta recipe over the top, we’re topping it with sweet cranberries – which I know isn’t a regular addition to your pasta dishes, but the touch of sweetness it adds pairs so perfectly well with the salty bacon you’ll be sprinkling on top and the creamy butternut squash sauce. Promise me you won’t skip the cranberries! And make sure your fridge is stocked with Hood® products this holiday season – a quick splash of Hood® Heavy Cream makes a sauce for any dish, Hood® Half & Half mixed with milk makes for the ultimate hot chocolate, and their ice cream? A must in any New Englander’s freezer! This comforting recipe of butternut squash that has turned into a velvety smooth cheese sauce and topped with savory bacon, sweet cranberries, and parmesan cheese is bound to impress! Preheat oven to 350F and fill a large stock pot with water over high heat. Place bacon strips on baking tray and bake for 12 minutes, until crispy. Once the water has boiled, add the butternut squash cubes and cook until fork tender. While it cooks, simmer heavy cream, cheeses, butter, and salt in a small saucepan. Remove from water (don't dump the water!) and place in cream/cheese mixture. In the meantime, cook pasta as instructed. Using immersion blender (or place in regular blender), blend all together until smooth. Add turmeric and blend. Add cooked pasta to sauce mixture. Serve immediately topped with chopped bacon, extra parmesan cheese, cranberries, and fresh thyme. May be one day i am going to make. Never thought to put roasted tomatoes into a salad, but of course it goes so well with the roasted squash. I added roasted beets since I had some. Don’t have pine nuts; subbed pecans. For the dressing, I didn’t have orange/juice and the stores don’t yet have frozen or fresh cranberries, so I reconstituted dried with hot water. Made my own balsamic dressing with a bit of Dijon mustard. Added strips of grilled tempeh (I’m really not obsessed with protein, but just wanted to use it up).